Whatever the season, families with babies and young children will be wanting to ensure they have the best possible home environment for health and happiness. With this in mind, we've picked the best humidifier for baby bundles that you can buy right now, carefully selecting them for functionality, quality, design, and in the interests of saving energy, we've also made sure that every one of the products we've chosen has been rated by the Energy Star program. What kind of Humidifier is Best for a Baby? When to use a Humidifier for a Baby? 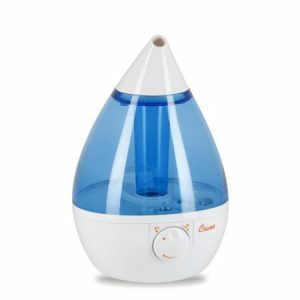 Warm or Cool Mist Humidifier for a Baby? 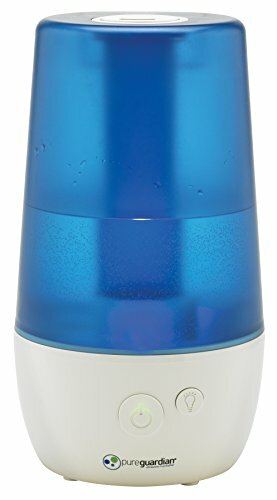 What is the Best Cool Mist Humidifier for a Baby? What Humidifier for a Baby Cough? 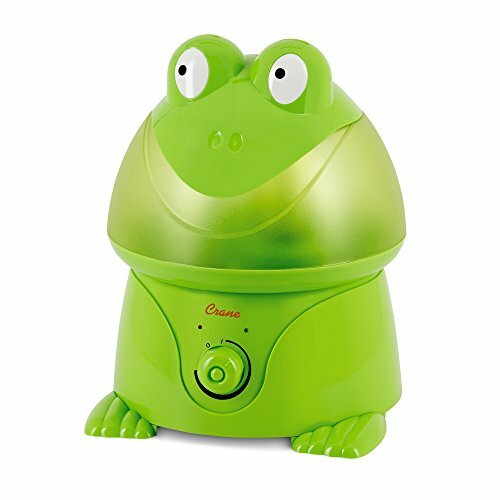 What Humidifier for Babies with Colds? Humidifiers are one of the items that can really help to make sure the cold, dry air often found in our houses doesn't irritate little noses or sensitive skin. Whether you just need a small humidifier for that inevitable cold, or a more advanced device for winter-long running, you'll find it here. 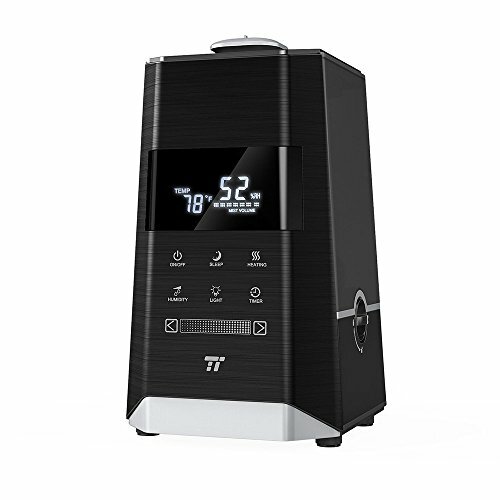 The first product on our list is the TaoTronics rotatable cool mist humidifier, which uses ultrasonic technology to infuze the air with moisture. It's a mid range unit that's designed to do pretty much everything you need, and we can say right away that this is going to be a really solid choice for a lot of people looking for the best all-round humidifier for their baby. You get a 0.95 gallon water tank, which is complimented by a very useful dual nozzle system pumping moisture out at 0.008 gal/hour. These two nozzles rotate through the full 360 degrees, which means that this unit can very quickly ensure that a very large space is humidified. There's a dial that allows you to adjust the rate too, so you can strike a good balance between humidifying speed and water use. 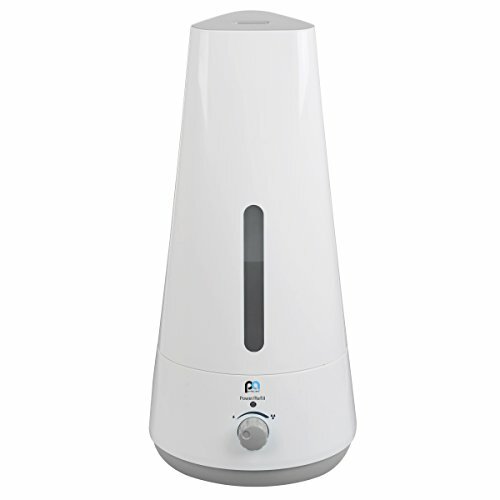 A common concern among those about to buy a cool mist humidifier is of course cleanliness, but this unit comes with built-in microbial filters, and is also very straightforward to clean. Perfect for parents who are meticulous about cleanliness when it comes to your little one. 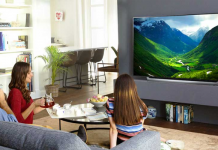 Why We Liked It - We're pleased to say that the TaoTronics TT-AH002 is a very solid choice, and it should be very close to the top of your list. It's been Energy Star rated, it's easy to clean and use, and it's very good at dealing with larger spaces quickly, with one of the best dispersion outlets. Next up is another TaoTronics product, but as you can see, this one is very different indeed. This is a top-of-the-range humidifier that does pretty much everything you could possibly want, and more. It really is one of the best. An LED display is the main point of visual contact, which shows you everything you need to see, from the temperature to the flow. You can slide between a normal cool mist to 100F without any difficulty at all, and it'll heat up in less than half an hour. You can also set the humidifier to maintain a particular humidity level, or set the timer whenever you wish. With a huge 1.6 gallon tank, this is the choice for you if you want to be able to fill the tank and let the device look after the rest, while you're looking after baby. It certainly doesn't look like a baby product, but if you're looking for something that can cater to any of baby's needs, then this could well be it. It would look great in a room used both by baby and parents too. Why We Liked It - There really aren't many options out there that are as versatile as this one, whether for the little one or parent. And what's more is that it'll do all of this while being Energy Star rated, and looking as great at it does too. It's very difficult to find fault, which is why it's on our list. It might just be the best humidifier you can buy. If you love to have nice things in baby's room, the nursery, or anywhere else in the home, then you'll want to pay attention to this next product. 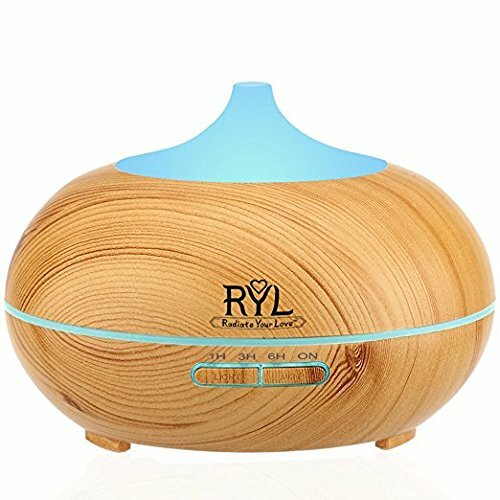 The Radiate Your Love cool mist humidifier and diffuser is a wonderful looking object that comes at a very attractive price. Forget your usual transparent plastic water tank - the Radiate Your Love humidifier looks unlike anything else on the market, with its delightful droplet shape and wood grain shell that's perfect for a trendy nursery. It's a very minimalist design, with buttons that select only the duration of time the unit is to be switched on for, and the tank is 300ml. This particular humidifier also doubles up as a diffuser. Most units will discourage the use of essential oils as they can damage the unit's function, but with this product it's positively encouraged. Perfect for relaxing with baby, it's the best of both worlds. Why We Liked It - It's not going to be the best for those who want to be able to change every little setting on their humidifier, and the small capacity means that it won't be suitable for those who need something that will tackle a large space for a long time, but it does a very good basic job, it looks fantastic, and is priced really well too. Pretty much all cool mist humidifiers are the same right? Wrong. While almost all of them do use ultrasonic technology, it's not always equal, and that's where Perfect Aire's technology comes in. The technology used by this brand means that the water vapour is vapourized into much smaller droplets than with most other manufacturers. Basically this means that the same volume of water can be dispersed more quickly, and cover a larger area when compared with your typical unit. It's really smart, and means that the 0.8 gallon capacity could go a really long way, no matter how long baby sleeps. This goes hand in hand with the PAU22's Energy Star rating - it saves power and it could save water too. Aside from this patent pending tech, you get a low water warning light, a dial to choose the output, and an automatic shutoff. Pretty much everything you might need alongside some of the best technology. Why We Liked It - Perfect Aire's excellent technology means that we've chosen several of their products on our list. The PAU22 is a great choice for those who want something sleek and unobtrusive in baby's room or the nursery, and don't need too many options on their humidifier. Vicks are well known for their products for helping babies and adults alike to get through a cold or the flu, and their range of humidifiers is certainly no different. The Mini FilterFree CoolMist' is, as the name suggests, a fairly basic little cool misting unit that gets the job done very well. It's also been designed to be the kind of humidifier that you can leave to run for a long time without you having to worry about it. After all, when you're looking after your little one, cleaning and replacing filters is not an extra job that you need. There are no filters, and on the low setting you can run this 0.5 gallon unit for up to 20 hours. Another nice little addition is the fact that this humidifier is designed to work with Vicks' range of VapoPads which can help to make baby breathe better when they have a blocked or runny nose. It's one of the best selling points for this humidifier. 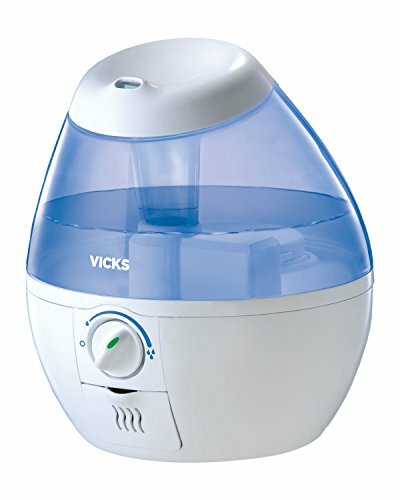 Why We Liked It - This is a great quality humidifier from Vicks that just works as you need it to. Nobody wants to have to worry about constantly replacing filters and changing water on their humidifier, and we're pleased to see that this unit will help you avoid that. The ability to use VapoPads is a nice touch too that would especially help when baby is suffering from a cold. 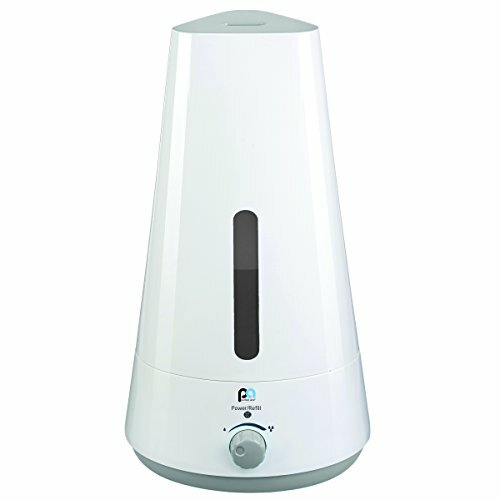 We've already covered the excellent benefits of Perfect Aire's patent pending micro mist technology with the PAU22, but this cool humidifier, the PAU13, is a bigger unit for those that need to humidify a larger space or want their unit to run for a long time without refill. The PAU13 comes with a hefty 1.3 gallon capacity, which on lower settings can run for an amazing 36 hours. With well over a day of humidifying available, it's ideally suited to busy parents who need a product they can set and leave. You can adjust the humidity level, and there's also a handy night light built-in, which makes it a great addition to baby's room. An anti-microbial carbon filter can also be found built in to the unit, so you can be sure that the mist that is being ultrasonically dispersed is healthy and won't cause the spread of bacteria. Ultimately, this is the best of Perfect Aire's range if you need a top end baby humidifier. Why We Liked It - Ideal if your little one is going to be spending a lot of time in a larger area, such as an open plan living space, the PAU13 from Perfect Aire is an excellent choice. We love the amount of time that it can stay in operation for, and the night light is a great touch. The price is also excellent for a humidifier of this capacity. Our final Perfect Aire product is the smallest of them all, the little 0.4 gallon PAU16. It's designed as a tabletop solution that you can easily move about and place wherever you need. Great if you want something that you can move between baby's bedroom and the nursery or living room. Not only is this humidifier Energy Star rated, but it's also rated at just 20W, which means that it'll consume a lot less power than some of its larger alternatives. In combination with Perfect Aire's micromist technology, this could well be the most economic and environmentally friendly option available, and the best for those who want to save money long term on their humidifier. Functionality is fairly basic, but it's probably everything most people will need. You can adjust the level of output, there's a low water warning light, and the unit will shut off automatically if it runs out. We must also note that this is a very quiet unit too. Why We Liked It - The PAU16 isn't going to be a solution for those with large rooms, but if baby sleeps in a cozy bedroom and you're looking for something whisper quiet, then this could well be it. It's minimalist but technologically advanced, which is why we've decided to include it on our list. The Crane Adorables line of products is one of the best on the market, and is perfect for parents who just love to accessorize their baby's room. Available in a range of adorable designs, including Hello Kitty, a cute panda and a frog, there's sure to be one that baby loves. They're certainly different to your usual humidifier design. Of course, these delightful little units are not all looks - they're very much functional too. While the basic functionality is limited to an adjustment dial and auto shutoff, that's all that most people will need, and the tank allows for an excellent 24 hours of humidifying - perfect for while baby sleeps. As this is a product very specifically designed with baby in mind, it's easy to clean, and much of it is made from antimicrobial material that helps to ensure bacteria and mold don't become an issue. These neat touches show that this really has been a carefully thought out humidifier, and it's one of the best for people looking for a baby focused humidifier. Why We Liked It - If you want a humidifier that baby will like just as much as you, then you can't go wrong with Crane's adorables line, and it's little surprised they're some of the best known humidifiers. They're very well priced, function well, and of course, they've been Energy Star rated too. We also really like the fact that you can choose from a variety of designs. 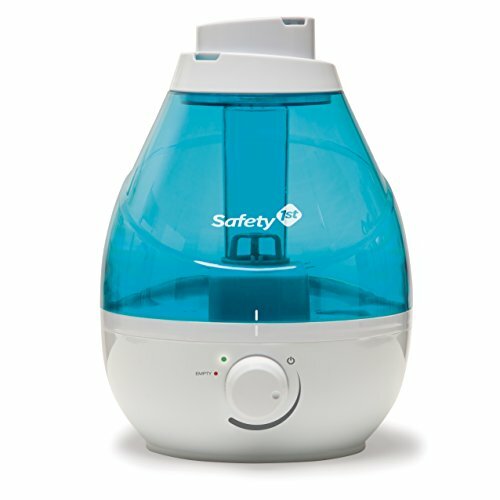 The Safety 1st cool mist humidifier is a great little addition to our list that will ideally suit parents that are looking for a unit that does everything pretty well at an attractive price. It's another option that comes with dual mist outlets at the top. These are really useful, because they rotate through the full 360 degrees, so you can point them wherever you need them to be. What's more is that unlike most humidifiers, they emit mist at an angle rather than straight up, which is useful if you need to place the unit under something, such as on a bookshelf. Aside from this, the large tank will give up to 24 hours of operation, you can control the humidity level, there's a low water warning light, and an automatic shutoff function. There are also sno filters to worry about, and access to the inside of the tank for cleaning is nice and easy. 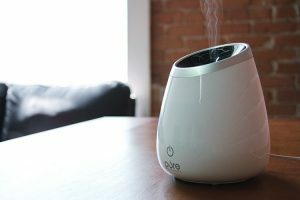 Why We Liked It - If you need a humidifier that doesn't mist straight upwards, then this has to be near the top of your list. It's a good all round choice, with a fairly long running time, and it's completely hassle free. 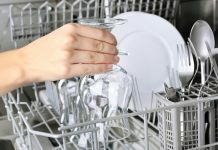 No filters to worry about, and it can be cleaned quickly, leaving you to do more important things. The final product we've decided to recommend is this excellent PureGuardian humidifier by Guardian Technologies. 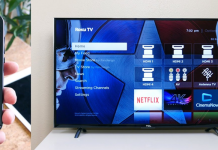 At first, it looks like many of the other units on our list, but we've included this one because very few products on the market come close to its very impressive 70-hour run time, which could be a market best. That's right - with one tank fill on the lower setting, this humidifier can keep going for almost three days straight. 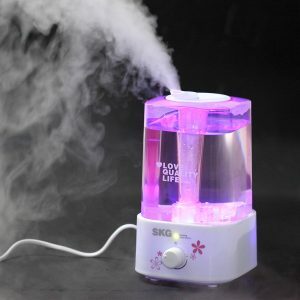 This really is a product designed for those who want round the clock humidifying without any hassle at all. Impressively, it does this with a gallon of water. In terms of features, there's just the one dial on this humidifier - for output level, but you also get a night light function which is great for baby's room. The water tank also uses SilverClean technology, which helps to fight off the growth of mold and bacteria that can be an issue with some humidifier units. Why We Liked It - The PureGuardian's ability to run for 70 hours on just a single gallon of water, while being Energy Star rated, means that it has to be one of the most efficient and environmentally humidifiers on the market. As a result, it's highly recommended. The TaoTronics Rotatable humidifier just had to be our top pick because of its great all-round attributes. It does virtually everything that most parents would want, and it has a couple of neat additions too that make it stand out above the rest. 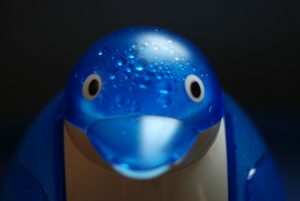 The dual nozzle misting outputs will be something that you wish almost all humidifiers had, because they're so useful. Not only do they mean that you can very quickly humidify a fairly large room in multiple directions, but their angle helps prevent condensation on anything that might be above the humidifier. Antimicrobial filters also ensure that this is a very clean unit too. For many people the draw of a warm mist humidifier is the cleanliness, but the filter simply eliminates that decision. And then in terms of humidifying ability, it has a good sized tank that can run for a considerable amount of time without refill, and the ultrasonic misting can pump out quite a lot of moisture rapidly which is ideal for larger rooms. Finally of course, the price is very good too. This isn't a premium-priced product, but it's well made, well specified, and will suit just about anyone. This is quite possibly the best humidifier on the market. If you want the very best for your baby, then this is it. Combining both cool and warm mist humidifying in one beautifully designed package, it's very hard to beat. The design is something that we really love. Not all baby products have to look the same, and this humidifier is testament to that. It's sleek and executive, and will look great placed in your living room, kitchen, or wherever you need it. It very much feels and looks like a premium product. Of course, it's not all about looks. The specification is simply head and shoulders above most other humidifiers on the market. The LED display allows you to see everything you need, but in a much more accurate way than the dials you'll find on most humidifiers. Combine this will the touchpad options that can control a huge range of functions, and we're definitely onto a winner. Being a TaoTronics, there's a dual nozzle system too. It is priced at the premium end of the humidifier market, but even then we still think it's great value because of all the features that you get, and the excellent quality design. 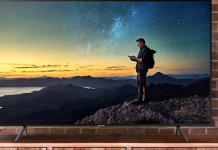 If your budget stretches to this TaoTronics product, then you should definitely consider it. We've chosen the Radiate Your Love humidifier as our great value pick, because not only is it priced very low, it's also something a little different. It's been designed beautifully, with that combination of wood grain exterior, water droplet shape, and the LED lighting. Certainly not what you'd expect from one of the cheapest humidifiers you can buy. It won't do lots of the fancy stuff that some higher priced humidifiers will, and it doesn't have a super long run time, but for most people it's very likely that the Radiate Your Love will suffice in making sure that baby sleeps or plays in a room with a good level of humidity. And while it'll look great in baby's room, it's sure to be stylish pretty much wherever you can put it. Which is great, because it also doubles up as a diffuser for essential oils and other aromatherapy scents. We just love it. The reason that humidifiers are considered such an essential item by many parents is because they are a very simple solution to a difficult problem; how to help keep small children healthy and comfortable when the climate outside is changing. When fall and winter arrive, children encounter a whole new set of problems with colds and sore throats, coughs and nasal drips. 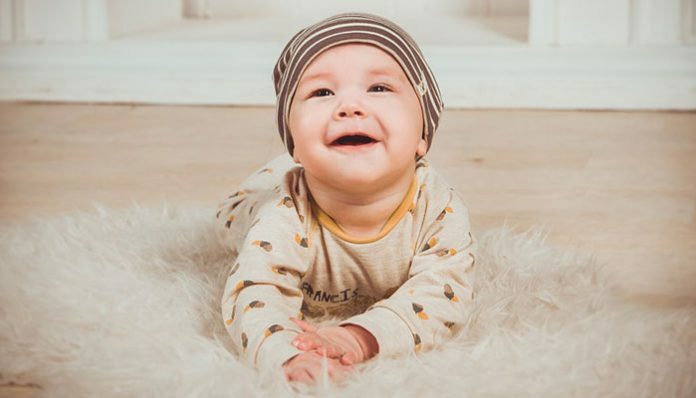 They are more vulnerable to the elements than adults, and with low body mass and immune systems that are still developing, babies are more at risk of developing respiratory illnesses. The air inside a house in winter can be kept nice and warm, but the issue is that the warming of the air inevitably dries the air out as its humidity drops. A device as simple as a humidifier can be the best way of getting moisture back into the air, and soothing dry throats and coughs. So generally, you'll find that the best time to use a humidifier is during the autumn and winter months, though this will depend on your particular climate. In some very dry places, humidifiers might be run for much of the year. Being small and easy to move, humidifiers can be easily placed almost anywhere in the home where baby might be spending much of his or her time. There are a variety of benefits that humidifiers can bring, which is why they're often recommended by physicians all over the world. Let's go through some of them here. The first is that correctly moisturized air is in fact cleaner air. This might not be immediately obvious, and in some ways it might seem counterintuitive, but it's totally true. The caveat is that the air must be at the right humidity. At the best balance, around 40-60% humidity, viruses such as flu find it harder to survive, so this could be a big benefit for your baby. It's also the reason that lots of people opt for a humidifier that will maintain a particular level of humidity. A more obvious benefit is in breathing. Cold, dry air can be harder for baby to breathe. It's more uncomfortable, and can irritate the sinuses. This can make baby feel unwell, and can even cause the nasal passages to become dry and sore, which in turn makes it harder for baby's nose to prevent ingestion of things like bacteria that would normally be prevented. Leading on from this, ailments such as the common cold are much worse for the sinuses and nose when the air is dry. Unmoisturized air will increase that stuffy feeling for baby, and given that lots of doctors do not recommend medication for babies, a humidifier could be one of the best solutions to this. We know that dry air can irritate and dry out the nasal passages, but did you know that it can also lead to dry and cracked skin too? Parents often have trouble with dry or irritated skin, which can be very uncomfortable for baby, requiring regular application of lotion, but humidifiers can go a long way in helping to keep skin soft and healthy. W hite noise is something that a lot of parents swear by when it comes to making sure baby gets to or stays asleep. The gentle hum of a humidifier is ideal for this, because it's a fairly unobtrusive sound, but is usually enough to be reassuring to a baby. Of course, if you don't want this to happen, there are plenty of very quiet options on the market. And as if all of that wasn't enough, humidifiers can even help to keep baby feeling warmer. It's not just the warm mist variants that do this either. Moisturised air does actually feel noticeably warmer and more comfortable. So you might even save on your heating bills (which we'll talk about even more later). Given that warm and cool mist are the most obvious differentiators between humidifiers, one of the most commonly asked questions is which one is best for a baby. In general, this will come down to your needs or preferences, so we're going to go into a little more detail about the benefits and drawbacks of each here so that you can make an informed decision. You'll often find when looking for answers that an article will definitely recommend one over the other, but we don't think that should always be the case when it comes to your baby. Let's start with warm mist variants. 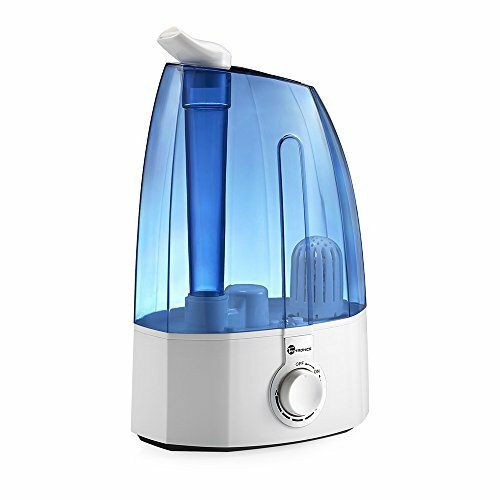 These models are often the cheapest and most basic (though there are plenty of exceptions) because the humidifying process is very simple - the humidifier (or vaporizer) will heat water to create steam and water vapour that is released into the air. There are a couple of apparent benefits to this too. The first is that warmer moisture being released into the air will naturally mean that the air will get warmer too, and many people find that they don't need to have their heating on as much during the winter months if they're using a warm mist humidifier (though this isn't an energy efficient method). The bigger supposed benefit however is that warm mist humidifiers are generally considered to be cleaner. This is because the heating and vaporization of the water will kill bacteria - much like a sterilizer. A final benefit that you may read about suggests that warmer humidifier vapor is best for baby to breathe. While this is true - warm air is more comfortable and reduces the risk of certain ailments - in reality, it is the temperature of the air that matters. By the time baby breathes the moisturized air in, it will be the same temperature whether it cam from a warm or cool mist humidifier, provided the room is the same temperature in both instances. The major drawback of a warm mist humidifier of course is that by their nature they will contain hot water and release hot steam. This could potentially burn a baby or child if they're left unattended. They're also not the best for efficiency. 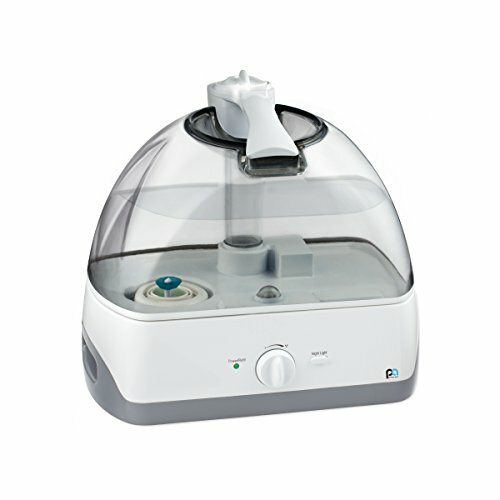 The humidifier more frequently recommended by Doctors for babies is the cool mist version. The cool mist humidifiers add water back into the air in a room without heating it, which makes them safer. Because the process doesn't involve heating water, the risk of spilling hot water or burning little baby fingers that reach out to touch the mist clouds is removed. In general, cool mist humidifiers remove the issue of killing bacteria by using a filter, so that removes the need to stick with warm mist if cleanliness is very important to you. You don't need to worry about baby being sick because you're using a cool mist humidifier. Virtually all humidifiers do the same job, so there's not necessarily a best humidifier for babies. What is important however are your own particular needs. They'll separate a good cool mist humidifier from a poor one. First is the ability for a humidifier to cover the space you need it to. Some very small portable humidifiers will struggle to fill a large room. This might not be a problem for baby's nursery, but if he or she spends time in a larger living area, you might want a humidifier with a higher capacity that can run for longer and ensure a larger room gets the humidity it needs. Next is general functionality. Most people will want at least a low water warning light, and an automatic shutoff function, but you might want more than that. The best humidifiers will come with sensors that mean you can set a specific humidity for baby, and the device will automatically disperse mist when it needs to. Just like climate control in a car. Finally, cleanliness will naturally be very important for people looking for a humidifier that's going to be used in a nursery or anywhere near a baby. There are a couple of different parts to this. Filters will help to ensure that the water vapour is free of bacteria, but you'll still need to clean the unit. The best humidifiers will have easy access to all of the bits that need to be cleaned regularly, and may even be made of antimicrobial materials. When baby has a cough, the most important thing will be keeping him or her comfortable while they recover, which is why humidifiers are popular in this case. They help to make sure that dry air isn't irritating their throat and making the cough scratchier than it needs to be. They can also loosen any mucus that might be sitting on the chest. As a result, we'd suggest opting for a humidifier that can run for a very long time without needing to be refilled, so baby can sleep uninterrupted in a room that is properly moisturised. Take a look at some of the units that can easily last for ten hours or more without needing any attention. It's very important to remember that humidifying isn't always the best option for babies that are suffering from a cough, because the cough could have been triggered by allergens that can sometimes be spread around the room by a humidifier. If in doubt, consult your doctor. For babies with colds, many of the same features that you'd want in a humidifier for a baby with a cough will be just the same. However, as the common cold often progresses through stages, including coughs, runny noses or blocked noses, we'd suggest a bit of flexibility. If you go for a humidifier that allows you to fully control the level of humidity in their room, you'll be able to change it depending on their needs. You might find for instance that a runny nose is exasperated with too much humidity. That number will probably shock most readers, and I will admit even the team here at Energyboom were surprised by it, but it is based on in-depth research carried out by the government's Energy Star program. The Energy Star program has published a report examining the U.S. market and national energy savings potential of residential humidifiers, which include portable and whole- house devices. In the U.S., humidifiers use approximately 0.11% of the total electricity consumed by households each year. The report consists of energy savings calculations based on estimated market penetration, technology type, and manufacturer-provided power ratings. There is very little, if any, correlation between humidification capacity (in square feet) and watt rating. A numerical value for the uncertainty of the national savings estimate cannot be ascertained because the variables contained in the calculations are derived from estimates provided by the manufacturers. For example, the estimated 8 million annual shipments of portable humidifiers and 350,000 annual shipments of whole-house humidifiers are a collective estimate among humidifier manufacturers. Estimated savings are based on a comparison of hypothetical humidifiers that consume energy at the 25th quartile of the market to a baseline of energy consumption at the 75th quartile of the market. The baseline for the inefficient product assumes a watt rating of 44.5 for ultrasonic cool mist, 81 for standard fan-based cool mist, and 220 for warm mist, by purchasing energy efficient humidifiers, consumers can collectively save an estimated 3.4 terawatts of electricity in the US over the course of the lifetimes of all portable and whole-house residential humidifiers. Note that while warm mist portable humidifiers are useful for easing the symptoms of illnesses, there are no significant use case differences between portable fan-based cool mist and ultrasonic models. Given the fact that fan diffused cool mist models consume, on average about 136% more energy than ultrasonic models, the EPA may wish to explore associated technology-based savings opportunities. Thus, while ultrasonic and cool mist technologies differ in energy consumption, they are effectively interchangeable technologies from a functional perspective. Similarly, while all whole house humidifier models perform an essentially identical humidification function, steam models consume, on average, 14,835% more energy than bypass models and 1,637% more than fan-powered models. Over the estimated four year lifetime of each product, and if all portable humidifiers meet the 25th quartile of energy consumption of their respective subcategory, the energy consumption calculation results in a savings of approximately 2.9 terawatts of electricity and $360 million. That reduction in energy consumption would also prevent approximately 4.5 billion pounds of carbon from entering the atmosphere. On a per -household basis, switching from an inefficient ultrasonic, cool mist, or warm mist humidifier to an efficient model will save approximately $5.44, $16.68, and $36.68, respectively, over the estimated four year lifetime. If every ultrasonic and non-ultrasonic cool mist humidifier purchase in the U.S. were comprised of only ultrasonic humidifiers, the energy cost per year would decrease by approximately 49%. Humidifiers have two main purposes in a residence: (1) to increase or maintain the amount of humidity in a given area and/or, (2) to ease the symptoms of an illness. According to manufacturers, energy consumption is generally not a purchase consideration for consumers. To ascertain a clear picture of the residential humidifier market, manufacturers of portable and whole-house humidifiers were engaged to gather information about humidifier shipments, energy consumption, product characteristics, test methods, the present state of the industry, and their interest in an ENERGY STAR specification for residential humidifiers. Each humidifier manufacturer expressed guarded optimism for a new ENERGY STAR program for residential humidifiers. One portable humidifier manufacturer pointed out that consumers make purchase decisions based on the price point, the immediate need (illness or lack of humidification), and/or the size of the room that needs greater humidification. For more information, see this report published by the U.S. Environmental Protection Agency (EPA) Energy Star Program. If you liked the review by Energyboom, please leave your feedback.